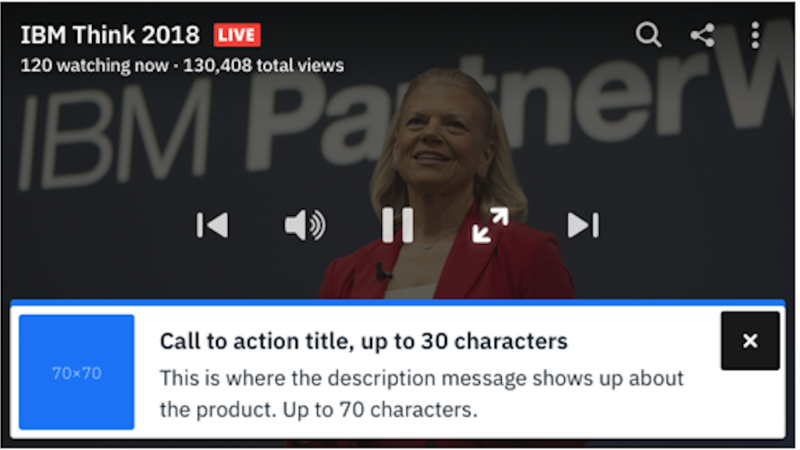 The IBM Watson Media Call To Action (CTA) feature allows broadcasters and marketers to display clickable image overlays on the player to promote content, make purchases, sign up for a service, or find out more information about a specific product or subject they saw in a live or recorded broadcast. 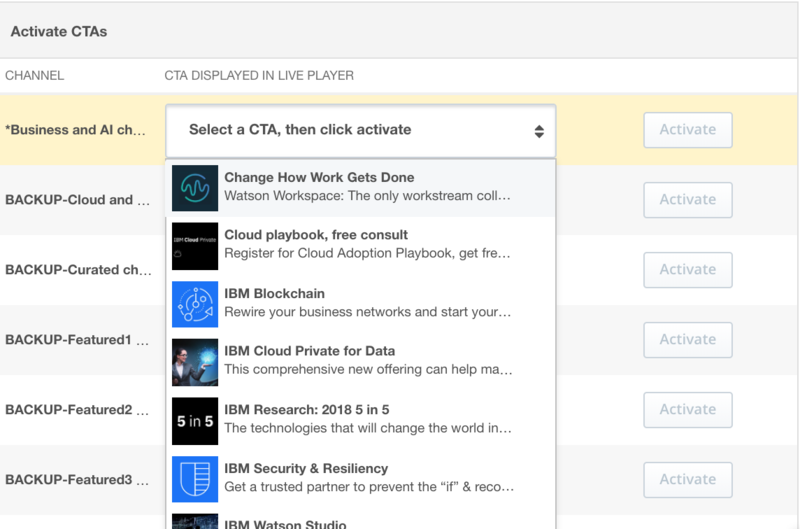 The CTA tab allows you to manage your CTAs and activate them for use. 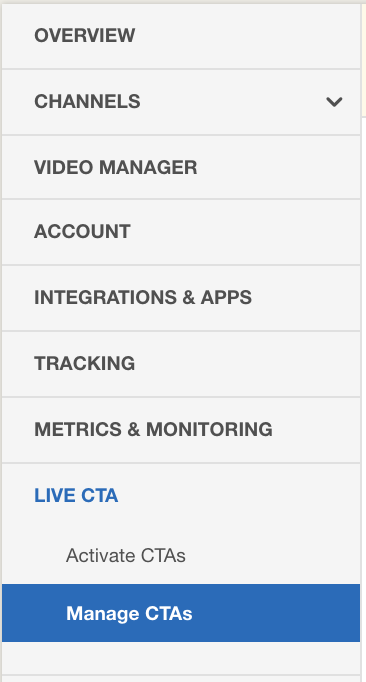 Under this tab, you can either manage your CTAs or activate them for use. 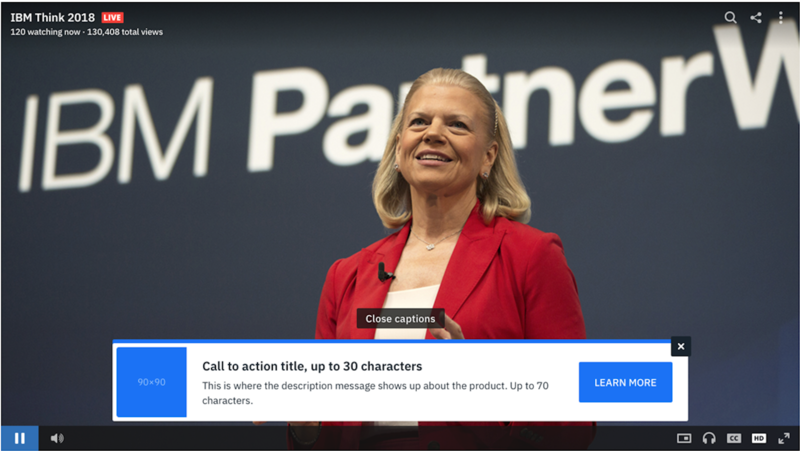 To create a new CTA, click on "Manage CTAs" followed by "+ Create new CTA". Complete the required fields on the page to finalize. *NOTE: please be aware of the image size limitations when uploading. Images must be jpg or png. Once this information has been completed and Saved, this specific CTA will appear under the list of Managed CTAs. If the fields need to be edited again, click on the downward pointing arrow next to the CTA. Once a CTA has been created, it must be activated on the player from the Activate CTA screen. 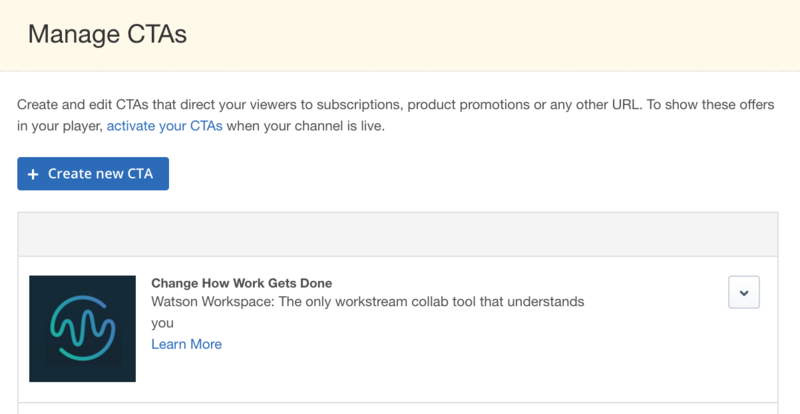 A list of all channels in the account will appear here, so the specific CTA can be applied to any channel. 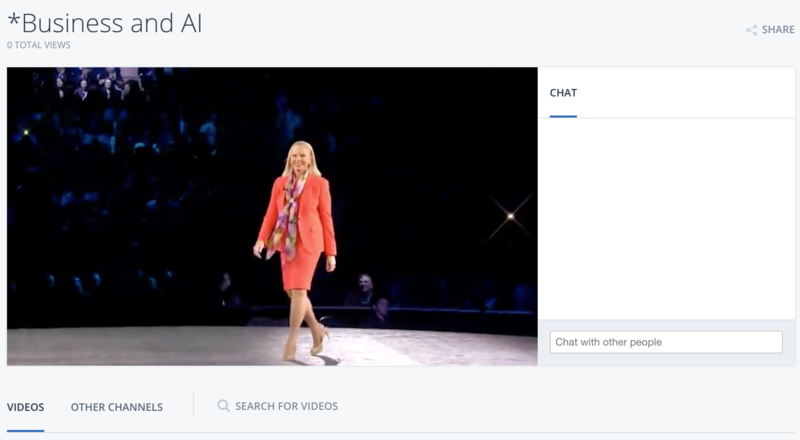 For this example, we’ve created a channel called *Business and AI and enabled the channel page for this demonstration. From the drop-down menu, we will select the appropriate CTA that should be displayed over this player. Finally, we will activate the CTA. Upon clicking the Activate button, the CTA will appear over the player. When viewer click on the “x” on the CTA module, the CTA will shrink in size towards the bottom left part of the player. *NOTE: once a viewer has minimized the CTA, they are unable to resize it to the original size. However, they still can click on the CTA to be brought to another site. To deactivate an active CTA, return to the Activate CTA screen and select “Remove”. Full size player: The CTA is limited to players sized up to 750 px. If the player does not exceed this width, all elements in the CTA will be visible (image, title, description, button). Normal size player: If the player is between 750 px and 640 px, the CTA will display all elements. Closing the CTA will hide the description and button. Medium size player: If the player is between 640 px and 480 px, the CTA button will be hidden. Closing the CTA will appear the same as the normal sized player. Mobile size player: If is below 480 px, the CTA description text will be hidden, but will display the button. 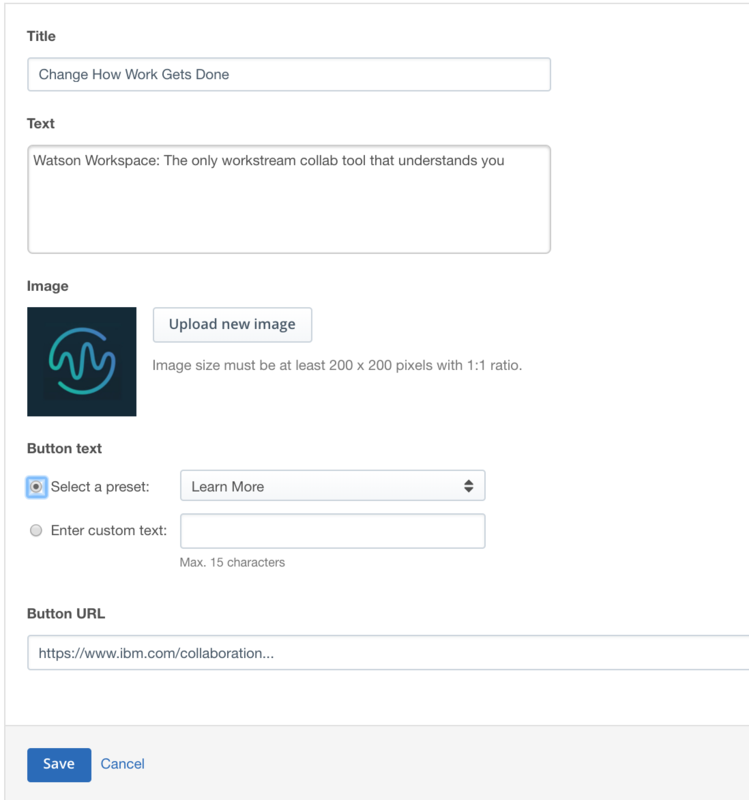 Closing the CTA will display only the title text. By default, when the CTA is activated it will appear inside the player. However, it is also possible to have the CTA appear outside of the player, displayed with a custom built HTML layout.